If you want to make an impression at the next big fashion show,commercial exhibition or outdoor party, consider an inflatable tent or inflatable dome from PanGo Inflatable factory. 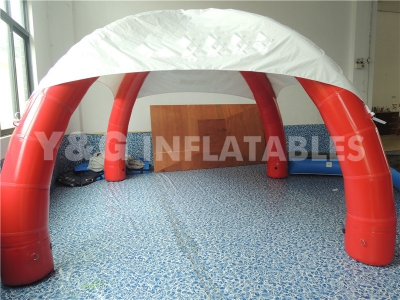 We can create any inflatable products，such as inflatable water park and inflatable slides or inflatable tent,etc . Inflatable tents and domes can be used at indoor commercial exhibition and outdoor party and are easy to set up and take down so you don’t have to worry about the logistics of portable buildings and traditional style tents. Our Professional design team can design inflatable tents that feature your company logo, products and colors so you can make a great impression with the customers. Use inflatable tents to house your trade show booth or to draw attention to where your company has product demonstrations set up. When used properly a custom inflatable tent can be a very effective promotional tool that will attract the attention of attendees at commercial exhibition, outdoor party, fashion show and other large party. Whether you need a small tent to cover a trade show booth or a gigantic structure to dominate the show landscape we have inflatable tents that can be used repeatedly to promote your business in the right way. We are capable of producing a range of tents to house your events and advertising promotions. As long as you give us an idea, we will design the inflatable tent for party.